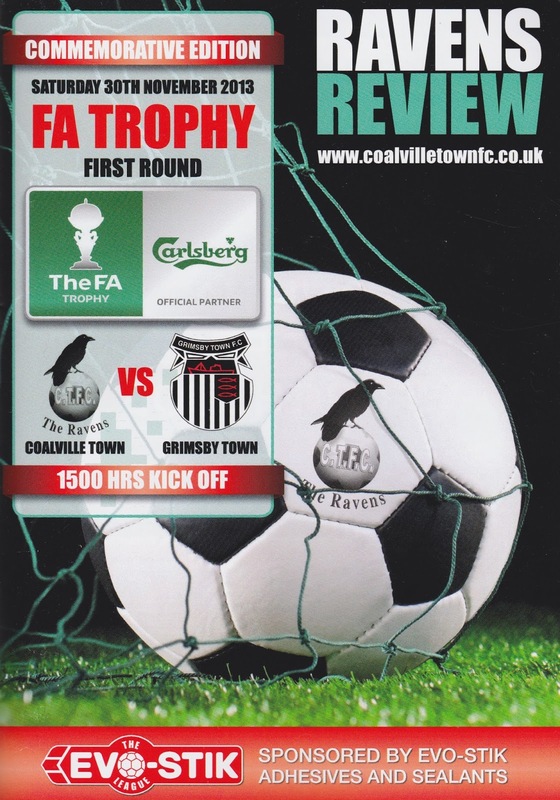 Now some more on that magical FA Cup run for Coalville. Or rather than to when we found out we were playing them. It was approaching the end of Tony Adams' miserable spell of manager of Wycombe. This consisted of horrendously boring football (though not as dreadful as the stuff we would experience under Peter Taylor a few years later). True to the form, we had suffered a mind-numbingly dull 1-0 defeat at Darlington and at the time I went on the coach, so faced a long journey home. The FA Cup draw proved a brief distraction as we waited to see who came out the hat. A lot of people on the coach were delighted when we were drawn at home to Coalville Town or Liversedge, though we would have preferred it to be away from home. We knew virtually nothing about either team as I didn't really follow that level of football at the time. But it was great to draw out someone that not many people had heard of - not because we were hoping for a big win, but because it would be nice to see something and someone different. The replay between the 2 sides would be in Leicestershire the following Tuesday, the 2 teams having drawn at Liversedge's Clayborn ground up in Yorkshire on the day the draw was made. The game was the same day as we played Swansea City in the LDV Vans Trophy, which happily we won 1-0. These were the days when the mobile internet was in its infancy - well before the days of social networking like Twitter too. Even a message board would have been a long shot, as would the club websites at the time, certainly no chance of a real-time update anyway. I had to rely on the old-fashioned phone call. Having put the number of Coalville Town in my mobile before leaving home, I rang them up at full time to ask what the score was. The man on the other end confirmed that they had won, 2-0 I think it was and so we knew our opponent for the next round, which would be played in 10 days time. In the intervening time, Tony Adams resigned from his job as manager. But bizarrely he didn't tell anyone at the club - chairman Ivor Beeks found out on BBC News at teatime! A parting of the ways was a good thing - he left us in 17th in League 2. It was in the week after a 1-0 defeat at home to Yeovil Town. After the media circus died down, we got on with it and put Peter Cawley in charge for the upcoming game. Coalville started in the very first round of the competition in August - the Extra Preliminary Round. They beat Daventry Town 3-0 before beating Gedling Town by the same score in the Preliminary Round. A 2-2 draw at Deeping Rangers in the next round saw them face a replay which they won 3-1. They then faced Rushall Olympic in the second qualifying round, winning that game 2-1. They won away to another Midlands side to set up a game at Willenhall, which again they came through. That saw them in the final qualifying round. Whilst the FA Cup draw had been fairly kind to them, their opponents Liversedge had a couple of giantkillings along the way, most notably beating Conference North side Harrogate Town. In the first game played in Liversedge records show that the home side had a goal wrongly chalked off for offside, a fact later backed up by the Sky Sports cameras that covered highlights of the game. 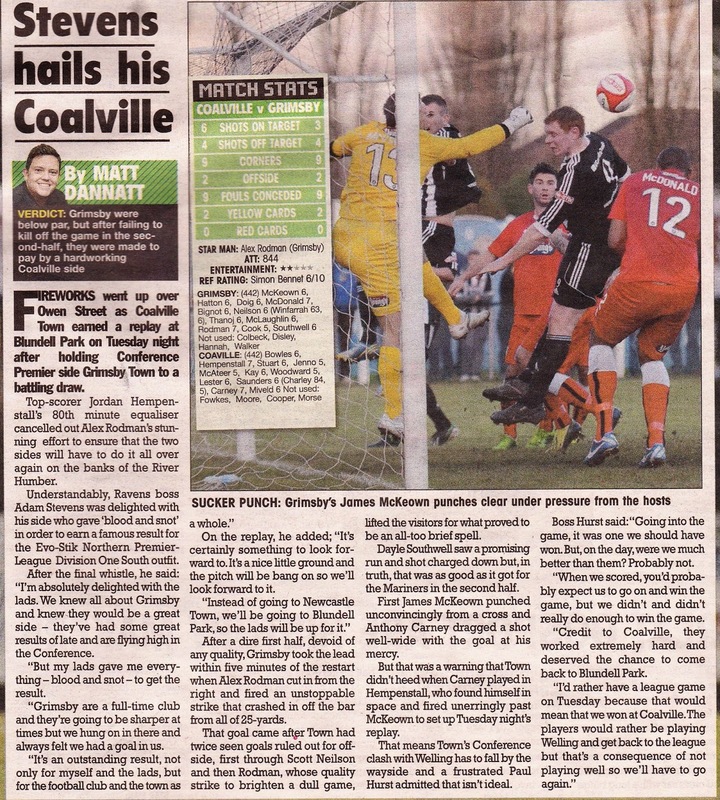 But Coalville prevailed in the replay and so they would be the side to face Wycombe at Adams Park in the first round. As mentioned above, the build-up to the game from Wycombe's point of view was tough, having lost a manager and been on a poor run of form in the league. Despite all this, the general consensus was that Wycombe would still win at a canter. Not that this dampened Coalville's enthusiasm at all - 908 fans travelled down to see the game. The first 10 minutes saw chances for Wycombe as the visitors started nervously. But on 15 minutes it took a smart save from Frank Talia in the Wycombe goal to keep out Chris Woodhall's free kick. Ashley Warner hit a shot into the side netting on 27 minutes as Wycombe lived dangerously. The home side did have a good chance before halftime though as Nathan Tyson headed wide. The second half was a bit more restricted chances wise and it took a solitary header from Roger Johnson to put Wycombe through on 70 minutes. Wycombe fans in the terrace unveiled a banner that said 'SACK THE BOARD' but it would take many more years of mistakes, incompetence and brinksmanship before the supporters finally got to take over the club. In many ways, it got worse with our very existence threatened due to financial mistakes. Wycombe had avoided a big shock and can count themselves lucky not to have been on the end of an upset. Though we were the better side, there was no way at all that we performed to our full capabilities and the Coalville side and their fans that day can be rightly proud of their 9 game FA Cup run. The team got a great reception from the fans and deservedly so. Wycombe couldn't perform a giant-killing of their own and lost in the next round to League 1 leaders Luton Town 3-0 at Adams Park to end their interest in the cup. I had waiting to go to Coalville for quite a while. Ever since we played them in the FA Cup 1st Round back in 2004 I had been interested in learning more about them. At the time they were at what is now step 5 level and we were drawn against them or Liversedge, another step 5 side who play in the NCEL League. In the intervening years I had stopped by and got some pictures from outside their ground on the way to a Wycombe game up north. They were still in the Midlands Alliance at the time and from what I could see it was your standard step 5 ground. Once I started doing groundhopping properly in 2011 I had vowed to return for a game. I tried to sell it to Anwar but he always fancied another option, so it remained unticked. Perhaps it was a blessing in disguise as a couple of weeks ago they were drawn at home to Grimsby in the FA Trophy first round. As regular readers of my blog know, I have a lot of friends from up there and will always select them as an option should they be playing at a ground that I have not been to before, unless Wycombe are playing at home of course. I announced my intentions of doing this game as soon as the draw was made and with Anwar looking to complete the 92 first and foremost, he asked could I drop him off in Leicester on my way up, as he had not done the Walkers Stadium yet. I was more than happy to oblige - it gave me company for most of the journey and just as important, helped me out with fuel costs. Things were nearly as bleak in the lead up to this weeks game. Wycombe had only won a third of their games at home and been on a very poor run. The latest showing against Exeter was again poor, we started well enough - taking the lead through Steven Craig on 8 minutes. But then, sadly as seems to be the case with Ainsworth's teams this season we time wasted and used gamesmanship to the extreme and are gaining an unsavoury reputation for using these sorts of tactics. It's not great to watch and it certainly doesn't make you proud to admit that your team uses them sorts of dirty tricks almost week in week out. Gareth Ainsworth has my full backing for the job, I still think he is the best we could hope for, as I do with the trust being in charge of the club. But I just wish we would cut out all the negative stuff as Exeter were there for the taking, having been on a poor run of form themselves. But it wasn't Wycombe who I would be going to see this game. 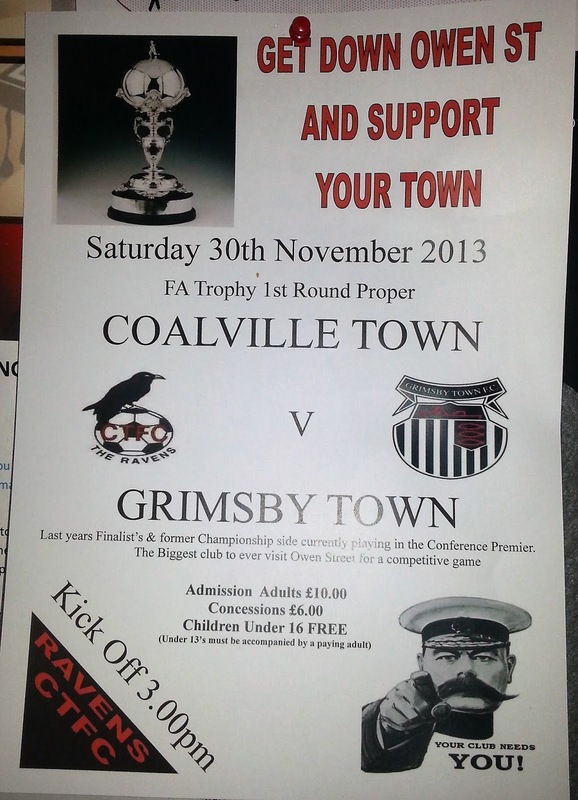 While Wycombe were playing at Dagenham I would be off to meet up with some mates from Grimsby as they faced Coalville. I had only met them a fortnight ago when I went up there for a couple of days. The next meet at Barnet in January seemed a long way off and so I was pleased when this draw came out. I had already seen Grimsby play this season as they scraped a 1-0 victory at Hyde back in August. As a strange coincidence, I also saw Grimsby last season when Wycombe were away at Dagenham. They drew 0-0 at Newport while Wycombe were losing 3-0 in Ainsworth's first game in charge. In fact, I had only seen 1 goal in the 3 latest Grimsby games that I had been to, as I saw a 0-0 at Telford the season before last. I had however seen a 1-1 draw as their reserves drew 1-1 with Rotherham, but it had been a poor goals return nonetheless. In the week leading up to the game I had another busy week at work, plus a couple of extra casual jobs so I was saving a bit thankfully, after having an expensive November. I was disappointed on Friday to learn that William wouldn't be coming, but he was like I got with the Wycombe games in that he didn't think he would enjoy it that much. When it gets to that stage, you are better off taking a break - I wen't home and away with Wycombe for 7 years and resented having to go back to the same old places that had little attraction for a day out. When the football got really bad under Peter Taylor I finally kicked the habit, but I wished I had done it earlier as I'd not been enjoying it for a while and was going out of habit rather than because I wanted to. It was costing me a lot of money too, that could be better spent on something I actually fancied. This season I am just going to the games that have something attractive about them - a meet, or more than likely in my case - a good pub. I have only done 2 so far and am only expecting to get 5 or so done in total. On the day I woke pretty early and had a bath. I was thinking of Wycombe's game at Dagenham and recalled the first time I went there with Wycombe. It was a good occasion for them - their first game back in the football league. But it's the only ground I have been to where the BNP were actively canvassing. Luckily they got short shrift from everyone and are about as popular in politics as MK Dons are in football. I picked Anwar up at 10.30 and soon we were on our way. After a bit of traffic in Aylesbury I dropped Anwar off at Leicester at 12.30 and by 1 was in Coalville. I knew John and Tom, the 2 brothers that I knew would be coming today which was a great bonus as I get on really well with them, and they are the nicest people you could wish to meet. I had a couple of hours to kill, so I headed down to Wetherspoons in town, and had a pint of Black Dragon from my favourite brewer Gwynt Y Ddraig. I saw there was a cider I had not tried called Manza Loca. It was £3.15 for one bottle or £5 for 2. They were fairly small so I opted for 2. It was quite unique in that it had Tequilla in it, and most important of all I enjoyed it. The pub was packed full of Grimsby fans who had made their way down for the game. After that, it was nearly 2 and so I headed to a nearby chippy and bought battered burger and chips before going back to the car to collect my things for the game. I paid my £10 to get in and looking at the attendance, they must have made a bit of money which is great news for the club. Despite a visible police presence, there was not any sign of trouble, so hopefully, Coalville weren't made to waste money on that side of things. I was delighted to meet John and Tom and we had a good chat before the game started. The game wasn't the greatest performance by Grimsby, but like the last time I saw them, Coalville played very well and fully deserved their draw. I have included the report from the non league paper below. After the game, I said my goodbyes and walked back to the car park with the lads as their coach was parked there too. There was an impromptu firework display to celebrate Coalville's result and it was around 5.15 before I left. I picked up Anwar from Leicester just before 6 and after a decent drive home, we were back home, having enjoyed our games. It was a lot better than going to Dagenham, that's for sure, what with Wycombe losing 2-0 and continuing their bad run of form. OWEN STREET started life as a basic step 5 ground and this shows as it is one of the smaller ones at step 4. There are 3 covered areas - a seated area along each side I think (probably a few hundred seats in total) It still provides enough cover for even their highest league attendance so far this season (212) Completing the set is some cover behind one goal, probably holding around 300. The rest is open standing, and Grimsby got just under half the ground, all of it open. Luckily the weather was fine today though. The segregation was of a very temporary nature. It's a shame they had to have it as both sets of fans are well behaved in the general scheme of things. Though both do have a minority who like to come and cause trouble for the big games, sadly this means the club didn't make that much out of today after paying Grimsby's expenses and giving them half the gate too. They had a club shop which a steward very kindly took me round to see. It offered a fair range of stuff but no pens or pennants that I collect. There were temporary food and bar facilities in the Grimsby end, not that I used them as I had eaten beforehand. Overall I was happy I came here, the club was friendly and helpful and with them in second place in the NPL D1 South, they stand a great chance of going up. Special mention to the excellent programme which was well presented and with plenty to read in it as well.